Millimetre Wave Antennas for Gigabit Wireless Communications covers a vast wealth of material with a strong focus on the current design and analysis principles of millimetre wave antennas for wireless devices. It provides practising engineers with the design rules and considerations required in designing antennas for the terminal. The authors include coverage of new configurations with advanced angular and frequency filtering characteristics, new design and analysis techniques, and methods for filter miniaturization. The book reviews up-to-date research results and utilizes numerous design examples to emphasize computer analysis and synthesis whilst also discussing the applications of commercially available software. 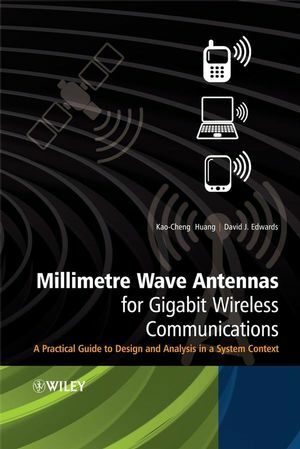 This book is an invaluable tool for antenna professionals (engineers, designers, and developers), microwave professionals, wireless communication system professionals, and industries with microwave and millimetre wave research projects. Advanced students and researchers working in the field of millimetre wave engineering will also find this book very useful. KAO-CHENG HUANG, PhD, is a Fellow of the Institution of Engineering and Technology UK, Vice President at the Dharma Academy, and President of the Association of Vijnaptimatrata of China in Taiwan. Dr. Huang is the author of two previous books, including Millimeter Wave Communication Systems, and holds several patents in the area of millimeter wave antennas. David J. Edwards is with Oxford University's Department of Engineering Science in the U.K. Acknowledgement: Chapter 3.5 contains text adapted from "Wolfgang Menzel, Dietmar Pilz, and Maysoun Al-Tikriti: MM-Wave Folded Reflector Antennas with High Gain, Low Loss, and Low Profile. IEEE AP Magazine, June 2002, pp. 24-29; Wolfgang Menzel, Maysoun Al-Tikriti, Ralf Leberer: A 76 GHz multiple-beam planar reflector antenna, European Microwave Conference, Milano, Italy, Sept. 2002, pp. 977-980 (Vol. III), and W. Menzel, M. Al-Tikriti, M. B. Espadas Lopez: Common aperture, dual frequency printed antenna (900 MHz and 60 GHz). Electron. Lett., Vol. 37, No. 17 (16th August. 2001), pp. 1059-1060." Material is reproduced with the kind permission of The European Microwave Association (EuMA) and Professor Wolfgang Menzel. The proportions of text taken from the above sources are highlighted in the attached papers for further reference. See the Downloads area for the updated pages.